Each year, the Irish Film Institute is invited to submit three candidates to compete for a place on the 28 Times Cinema Panel. 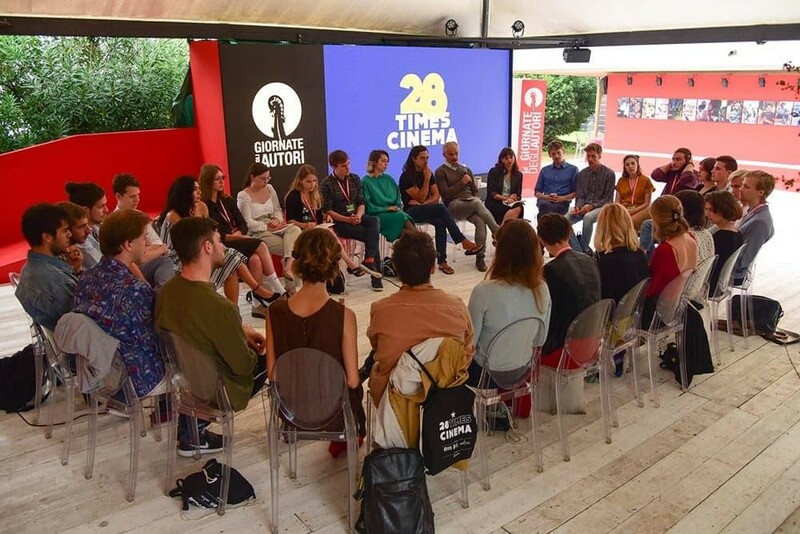 This panel is made up of young people aged 18-25 from across Europe who attend the Venice Film Festival, discuss, critique and report on their experiences. It’s a swelteringly warm weekday afternoon in the middle of June. I’m sitting at home on my couch in Dublin, mindlessly consuming daytime TV whilst trying to fend off my dog from doing the same to my lunch when I hear my phone buzz twice on the coffee table beside me. Carefully maneuvering my body so as to keep ample distance between my sandwich and the hungry mutt, I reach across to check my messages. I’d been waiting months for this message to come but, in all honesty, never seriously expected it would arrive. A little over two months later, on a searing August morning in Italy, I’m sitting with 27 other young cinema lovers – each of us representing one European Union country and one cinema from Europa Cinemas’ 1,100 strong network – on the opening day of the 75th Venice International Film Festival. Together we make up the participants of this year’s 28 Times Cinema Initiative. Where the magic happens. The Palazzo del Cinema – main headquarters for the festival. 28 Times Cinema was set up in 2010 by the LUX Film Prize of the European Parliament in partnership with Europa Cinemas, Cineuropa and Giornate degli Autori. 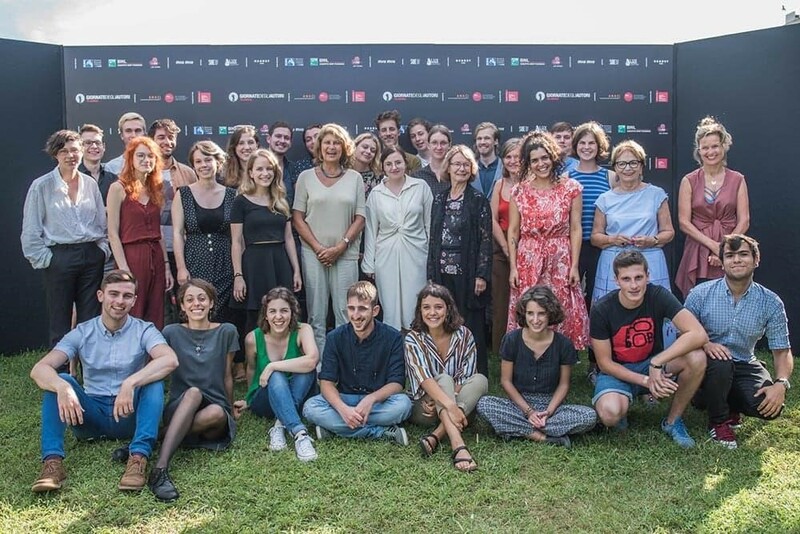 Each year they choose a group of film enthusiasts between the ages of 18-25 to attend the entirety of the Venice International Film Festival and, since 2014, the participants have served as the jury for the Giornate degli Autori Director’s Award, which is the top prize in the Venice Days section of the festival. I’ll admit that the overwhelming emotion I felt as we gathered for our first group meeting was nervousness. I recognised most of the group’s faces from the online profiles posted in advance of our arrival but couldn’t help feeling some initial anxiousness meeting them all in person for the first time, which was compounded by us needing to pass a microphone around in a circle and introduce ourselves one by one. What reservations I had, however, quickly fell away as we began to talk about our packed schedule in Venice and it wasn’t long before a group of us had grabbed hold of the nearest festival programme to figure out how we were going to cram in as many film screenings, masterclasses and workshops as we possibly could. Our primary duty over the course of the festival was to make up the jury for the Giornate degli Autori Director’s Award. There were 11 films from across the world competing for the prize this year, with productions hailing from across Europe, Asia, the Americas and the Middle East. While much has been made of this year being the 75th edition of the Venice International Film Festival, the oldest film festival in the world, Giornate degli Autori is also celebrating its own anniversary. This year marks it’s 15th annual edition, with the section – which was originally inspired by Cannes’ Directors’ Fortnight – having launched in 2004. Giornate degli Autori encourages independent filmmakers and risk taking, making it resemble something of a younger, more alternative festival within a festival. 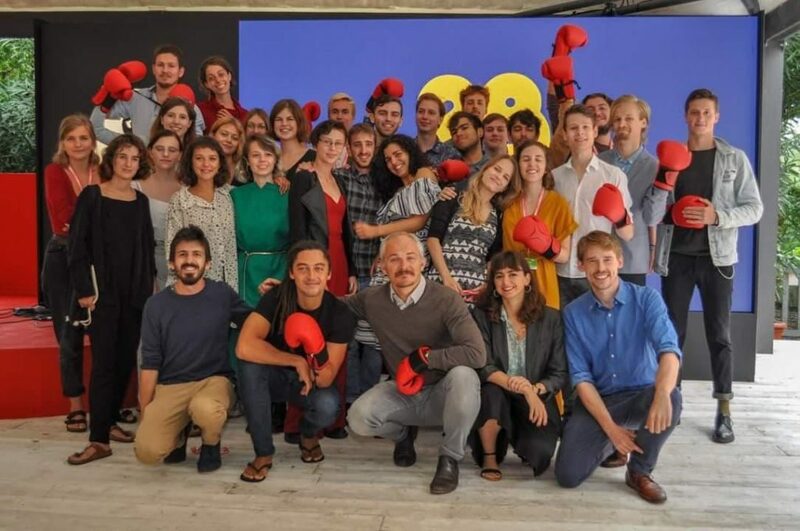 President Roberto Barzanti and General Delegate Giorgio Gosetti wrote in their programme notes this year that their aim with the section has always been to bring “innovation, diversity and experimentation to Venice.” And, based on this year’s official selection, they’re succeeding. The full 28 Times Cinema team. You wouldn’t want to meet this lot down a dark alley. Nearly all of the films in competition were brave and daring, not afraid to take on challenging subject matter and test the established boundaries of their genres. The lineup also showcased the work of five female directors, both new and established, ensuring the section fulfilled its promise of diversity. This is especially important to note as, in a year that Venice has drawn loud criticism for the lack of female filmmakers included in its official selection (Jennifer Kent’s The Nightingale being the sole female-lead film out of a total 21 competing for the prestigious Golden Lion), Giornate degli Autori has taken on the title of flag-bearer for female directors at the festival. We watched all 11 of the competing films on the big screen, often at the premiere screening with cast and crew in attendance. After every 3-4 films we’d meet as a jury to discuss what we’d watched, with the focus on debating what did and did not work about each individual film. These meetings, each lasting a couple of hours, were pretty exhaustive – with each film given equal attention in our analysis. Not many of us had ever been on a jury before and it was exciting to watch people develop their own styles as jurors as the meetings progressed. Some of us had different preferences and conflicting ideas about the most important factors to consider as a juror when discussing a film and, ultimately, giving out an award. 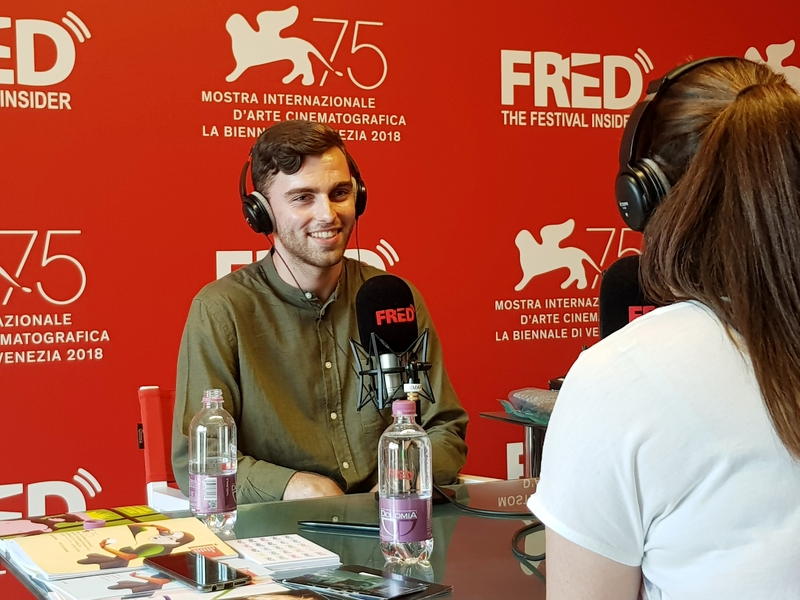 We were guided through the process by mentor and moderator Karel Och, artistic director of the Karlovy Vary Festival, and jury president Jonas Carpignano, whose film A Ciambra was Italy’s selection for Best Foreign Language Film at this year’s Academy Awards. Karel and Jonas were brilliant to learn from, each of them guiding us through the jury process by highlighting certain perspectives and new ideas about filmmaking which helped us to analyse each work. But crucially both were also equally happy to listen to our conversations and our arguments, making sure that we were allowed to bring our own, independent opinions about each film to the table. Giornate degli Autori Director’s Award final jury discussion. After much debate we managed to narrow our selection down to just three films which would advance to our final, public jury discussion. These were Elsa Amiel’s Pearl, Claire Burger’s Real Love and Félix Dufour-Laperrie’s Ville Neuve. The Director’s Award could easily have gone to any of these three, with each being passionately championed by different sections of the group, but Claire Burger’s film ultimately triumphed after two rounds of voting. The entire experience of being on a jury was fantastic. It was so great to be surrounded by like-minded people who were equally passionate about cinema and everybody was serious about the responsibility we had as jurors to approach each film analytically and without bias. The other 27 jurors each brought their own personality, energy and enthusiasm to the conversations and it was really inspiring to get to engage with them throughout the whole selection process. Away from serving on the jury our festival schedule was pretty packed. As part of 28 Times Cinema we had access to a host of panels and workshops over the course of the festival which focused on the current state of the film industry and the past, present and future of film festivals. We also attended screenings of the three finalists in this year’s LUX Film Prize Competition as well as a Q&A with each of their directors. Set up by the European Parliament in 2007, the LUX Film Prize aims to bring the best of European cinema to more European people. The three finalists this year – Mila Turajilic’s The Other Side of Everything, Benedikt Erlingsson’s Woman at War and Wolfgang Fischer’s Styx – were easily among the most impressive films I got to watch over the course of the entire festival. 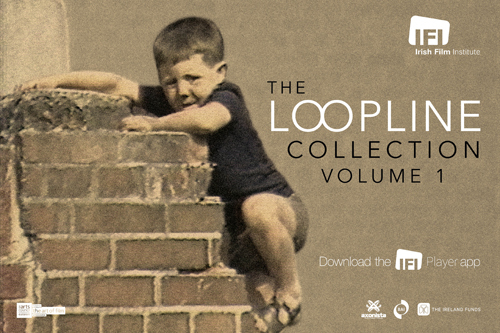 They’ll each be screened throughout all 28 EU Member States between October and December this year – Irish dates haven’t been confirmed yet but I can’t recommend seeing the three films highly enough. I – along with a lot of the rest of the group – tried to cram in as many additional films into our days as we could, a team effort which really which put our organisational skills to the test. We’d get up especially early – or stay out late – to catch screenings of the titles vying for the Golden Lion. I missed the chance to watch a few of the big titles at the festival – notably Damien Chazelle’s First Man and Luca Guadagnino’s remake of Suspiria – but did manage to see a lot of the films that’d been on my personal watchlist before the festival. Highlights included a surprisingly giddy morning press screening of the Coen Brothers’ The Ballad of Buster Scruggs, a hilarious anthology set in the Old West which had the whole audience whooping with joy within it’s opening ten minutes, and Brady Corbet’s Vox Lux, a smart and stirring social satire which draws career-best performances from Natalie Portman and Jude Law. Jacques Audiard’s first English language effort The Sisters Brothers – a darkly comic western starring John C.Reilly, Joaquin Phoenix, Jake Gyllenhaal and Riz Ahmed – was my most anticipated film heading into the festival and it didn’t disappoint, delivering a refreshingly slow, subtle and consistently surprising take on a well-tread subject matter. The masterpiece of the programme was undeniably Alfonso Cuarón’s spectacular Roma. The film, which takes place in the Roma district of Mexico City in the early 1970’s, marks Cuarón’s triumphant return to his native language and is a sprawling, heartfelt snapshot of a tumultuous time in the life of a local girl, the middle-class family she works for and the city she lives in. Beautifully shot in black and white, every individual frame is carefully curated by a filmmaker at the absolute top of his game. It surprised nobody by winning the Golden Lion award for Best Film and, although it’ll soon be available for streaming on Netflix, this sweeping behemoth definitely deserves to be seen on a big screen if possible. My personal favourite of the festival, however, was Jennifer Kent’s aforementioned The Nightingale. Her long awaited follow-up to The Babadook is a masterfully made, viscerally violent revenge thriller set in the harsh wilderness of the Tasmanian outback. Viewer discretion is strongly advised – the film is unapologetically brutal, one of the main reasons that it has sharply divided audiences so far – but it was deserving of the Grand Jury Special Prize it took home on the closing night of the festival. Away from all the films, the panels and the workshops the experience of just being in Venice for the entirety of the festival was a wonderfully surreal one which I won’t forget in a hurry. This was my first time attending an international film festival of this scale and I can’t help but wonder whether I’ve been spoiled by the whole thing. 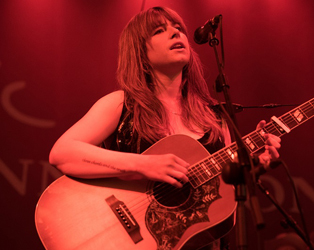 It takes place on the Lido – a long, thin island which is a short boat ride away from the glittering canals, Renaissance cathedrals and souvenir stalls that come to mind when one usually thinks of Venice. The festival is held right beside the beach, with the area boasting a very laid-back atmosphere which is a far cry from the tourist-clogged centre. In some parts of the island you’d think the locals don’t even know it’s happening. The intimate, relaxed nature of everything also lends itself very well to celebrity sightings. Whether eyeing them from the red carpet, casually bumping into them walking the streets or almost accidentally knocking them down the staircase of a hotel (as one 28 Times Cinema ambassador very nearly did to David Cronenberg) you’d be pretty unfortunate to go to the festival and not see somebody famous. I wouldn’t have imagined even six months ago that I would get the opportunity to participate in 28 Times Cinema this year. Attending the Venice Film Festival and getting to represent Ireland on the Giornate degli Autori jury was an amazing opportunity that I’ll always cherish and I feel as though I’ve made lifelong friends with the 27 other ambassadors, an incredible group of people that I feel very lucky to have been a part of. There have already been talks of a reunion soon, so I don’t think it’ll be too long before we all see each other again. Before I sign off I want to thank everyone at the Irish Film Institute for supporting me and for making this whole thing happen. 28 Times Cinema has been one of the greatest experiences of my life so far and I’d strongly recommend that any young person who has a love of cinema (and the ability to stay awake through 4-5 films a day) apply to participate next year.